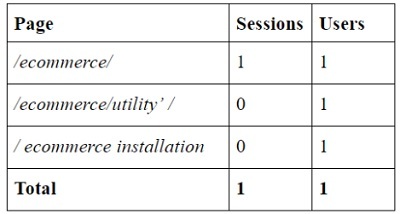 Why Google Analytics Show Zero Sessions? How come a page has got pageviews but is still not a part of a GA session? How come a page has got 1 user but still no GA session is assigned to it? This happened because Google Analytics assign session count only to the first hit in a session. A hit is a user’s interaction (pageview, screenview, event, transaction etc) with your website that results in data being sent to the Google Analytics server. A group of hits recorded for a user in a given time period is called ‘session‘. A session count is the number of sessions recorded by GA in a particular time period. When a person enter your website via a page (called the landing page), it triggers a pageview hit. If this is the first hit sent to the Google Analytics server then GA assign the session count to the ‘pageview’ hit. But GA does not assign session count to subsequent hits in the session. As a result landing pages are assigned session count. So in your GA reports you can see session count for all landing pages. Any page which is not a landing page does not trigger the very first hit (like very first pageview, screenview, event, transaction etc). As a result no session is assigned to such pages and you see zero sessions reported by GA.
Now how come this page has got 1 user, 1 pageview, 1 unique pageview and 1 exits, despite of zero sessions? Google Analytics assign 1 user to each page in the session. Here GA has assigned the same user to each page he visited in a session. 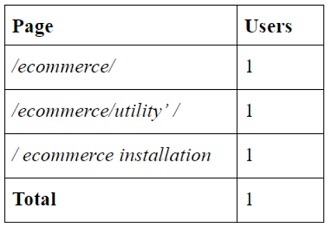 But since it is still a single user, GA reported only 1 user (in the total column). If GA doesn’t do that then the ‘users’ metric will be inflated and you will see more users than the one, who actually visited your website. You may find this type of reporting weird but that’s how it is, for now. An exit is counted only for the page from which a user left your website. 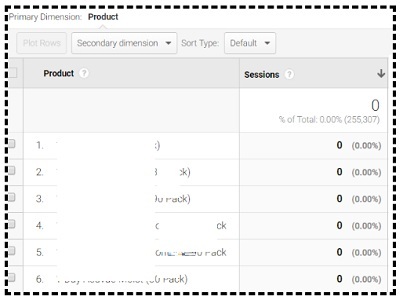 Here, ‘/ ecommerce installation’ is not the landing page, so all session based metrics are reported zero by GA.
You are more likely to see zero sessions in your report when you create and use custom reports which query session metrics with hit level dimensions. So avoid doing that and you should be fine.